An increase in the number of asylum seekers arriving in Canada from the US has those north of the border looking closely at Donald Trump’s immigration policies. Canadian politicians are at loggerheads about how to deal with the new flow of migrants. Montreal (dpa) – It’s not a spring flood yet but it is a rising tide that has officials in Canada’s capital, Ottawa, worried. The growing number of asylum seekers crossing illegally from the United States into Canada has Canadian leaders concerned that they might face a torrent of refugee claimants fleeing US President Donald Trump’s immigration policies once the northern hemisphere summer starts. Since the beginning of the year, hundreds of asylum seekers have walked through a park in the US state of Washington opposite suburban homes in Surrey, British Columbia. Others have trudged through snow-swept prairie fields on the border between Minnesota and Manitoba or crossed through maple forests between New York state and Quebec. 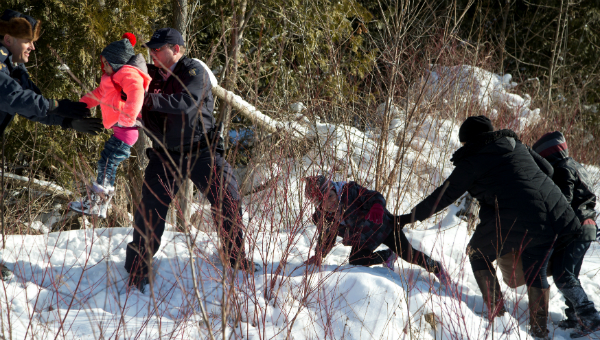 In fact, according to the Canadian Border Services Agency (CBSA) there was a six-fold increase in refugee claims at Quebec’s land border with New York, Vermont and Maine in February compared to the same month a year earlier. A total of 635 people requested asylum in February after crossing into Quebec from the US, compared with 99 in February 2016, the Canadian Broadcasting Corporation said, quoting CBSA officials. A month earlier, in January, 452 people claimed asylum at Quebec border crossings, a 230 per cent increase from January 2016. Canadian officials say that while there have been increases in the number of crossings by asylum seekers into other Canadian provinces, Quebec has experienced the largest increase in asylum claims. The border crossings, which refugee advocates call irregular, not illegal, were one of the main issues discussed by Canadian officials and US Homeland Security Secretary John Kelly during his recent visit to Ottawa. Canada’s Public Safety Minister Ralph Goodale says many questions remain about the number of migrants who enter Canada somewhere along its largely open 8,891-kilometre border with the US. “Who are the people who are involved in this migration? Where did their journey begin from?” Goodale asked after the meeting with Kelly. Both US and Canadian officials are perplexed that many of these asylum seekers – most of whom came from the Middle East and Africa – had valid entry visas to the United States. There is speculation that Trump’s executive order on immigration has been a factor. The original order, signed one week after Trump was inaugurated, temporarily banned entry to the US from seven majority-Muslim countries and suspended the US refugee programme. But after large protests and criticism that it was in effect a “Muslim ban,” it was put on hold by US courts. On March 6, Trump signed a revised executive order, but that too was blocked by a federal judge in Hawaii. At the same time, US law enforcement agencies have been conducting sweeps to capture and deport illegal immigrants who have criminal records. It all makes for an uncertain future for refugees currently residing in the US. Under the Third Safe Country agreement between the two North American neighbours, most refugee claimants seeking entry to Canada from the US are turned away at a border checkpoint because Canada considers the US a safe country for refugees. However, under Ottawa’s interpretation of the UN Convention of Refugees the country is obliged to hear all asylum claims filed by people who make it into Canada. “The fact of the matter is if someone comes across the border, and finds themselves in Canada, and claims asylum … when they’re here, they’re here,” Goodale told Canada’s CTV news. On migration, the Liberal government of Prime Minister Justin Trudeau has found itself in the crossfire of two opposing sides. On the left, the New Democratic Party is calling on the government to rip up the Third Safe Country agreement with the US, which would remove the reason many asylum seekers risk a potentially dangerous illegal crossing. From the right, the Conservatives want the Liberals to “enforce the law” and get tough on people who cross the border illegally. Goodale has ridiculed the Conservatives for their approach. “I guess what the Conservatives are saying is maybe we should line up the [Royal Canadian Mounted Police ] at the border, they should all link arms and shoo people away, or maybe [use] fire hoses or whatever, to keep people from crossing at the border,” Goodale told CTV News.